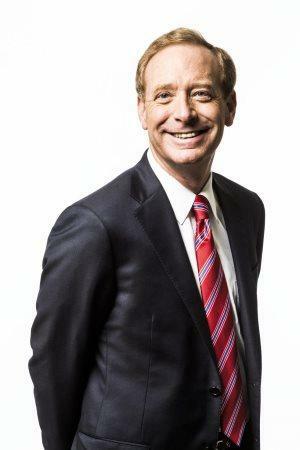 Microsoft president and chief legal officer Brad Smith paints a bleak picture of a future where facial recognition technology has been rolled out without restriction. "If we're not careful this technology will go forward without thought, without legal regulation and we're going to wake up in the year 2024 look around and say: Wait a second – this feels like a day out of the book 1984 instead," he told a University of Sydney audience last night. The technology – which is capable of identifying an individual from an image or video feed – has the potential to "follow anyone anywhere; follow everyone, everywhere, on a scale that is literally unprecedented" Smith said. That dystopian vision is not so distant. China's 'Skynet' surveillance system uses facial recognition technology and an extensive network of cameras to track everyone from wanted fugitives to jaywalkers. In Australia, the government is building its own national facial recognition service – 'The Capability' – one the Australian Human Rights Commission has warned could have an “unprecedented” impact on citizens’ privacy. As the technology becomes more ubiquitous – today found in proof of concept NAB cash machines, at cricket matches and at major airports – "it's time to start to take some steps" Smith said. Over the last few months, Microsoft has been detailing what those steps should be. After calling for regulation of the technology in a July blog post, in December Microsoft published six principles governing its own work in the area. More recently the firm has moved to directly lobbying governments to legislate to stop facial recognition from becoming what Smith called a "race to the bottom" among vendors doing "any deal under the sun". It is, however, working hard to make sure any regulation is made on its own terms. In Washington state in the US – home to Microsoft's Seattle headquarters – the company earlier this year backed a bill that closely mirrored its six principles. Last night Smith described this as the government saying: "Hey this is a good approach, we'll pass a law based on this". That's a slightly glossed account. The state's initial bill – which Microsoft pushed back on – included a ban on government use of the technology until certain conditions were met, such as proof accuracy was consistent across race and gender. The Microsoft-backed bill in turn was opposed by civil liberties groups and was far less restrictive. "Microsoft, unfortunately, is just talking the talk," wrote the American Civil Liberties Union (ACLU). One of the six principles, which carried into the bill, was for users of the technology to 'provide notice' of its use, for example a sign at the entrance to a store. "What good is that in a world where face recognition is so widespread that nobody can opt out?" the ACLU said in a January editorial. "I'm optimistic that we'll see this in law by May of this year," Smith said last night at an event organised by the university's United States Studies Centre. "Imagine that. Imagine being able to identify a technology problem propose a regulatory or legislative solution, put it out in December and have a new law by May. That is like Internet speed!" Smith added. Undoubtedly, regulators and legislators are struggling to keep pace with advances in the technology. It is with bamboozled and until recently "laissez faire" governments that Microsoft sees an opportunity to help. Smith said that "here in Australia for the first time and then around the world" the company was demonstrating to lawmakers that 'minimal viable software product' creation principles could be brought to legislation. "Can we move this kind of concept from software development to technology regulation?...We need to recognise the importance of governments starting to move faster so what we're really advocating for is a new approach to technology regulation," Smith said. Through working with government's, Microsoft is able to "ensure that the public's voice is heard" on facial recognition technology, Smith argued. Australian civil liberties experts are not convinced. University of Sydney law professor Kim Weatherall tweeted last night: "Hahaha Brad Smith asserting that views of the public on facial recognition are reflected in legislators who govern for us all". QUT research fellow Monique Mann echoed the sentiment, questioning how best to describe Microsoft's approach: "Co-regulation? Self regulation? Regulatory capture?" she tweeted.